On July 7th, 2013, the router which I have used for the past five years of my life was unplugged for the last time. This router, which I have affectionally called DD-WRT, WRT54GL, and Fricken router (among other things) throughout the years, has been with me through some big parts of my life. This is a short summary of the good times we had together. In the Fall of 2008 a few of my friends and I decided to set up a private network in our dorm. We used a pair of WRT54GLs, a 24 port switch, and about 1000ft of ethernet cable. 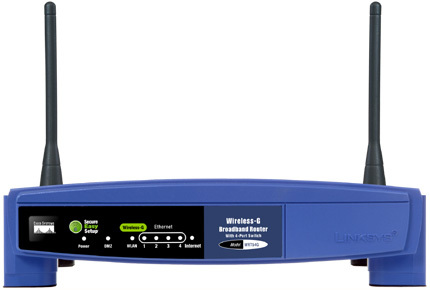 We mainly used this network to play Xbox with each other, which was much faster than trying to deal with the slow connection offered by the school. After some of my friends moved to a different dorm, we came to a realization: My window was in a direct line-of-sight with their new dorm room window, with only a parking lot in between them. So, we loaded DD-WRT onto our routers and set them up to talk with each other using WDS. We boosted the Tx power on the antennas so we could get better reception, even though we knew it might cause heat issues. In the end, we had about 20 rooms hooked up together spread across all three floors in my dorm and the floor in a separate building. More about this network here. My senior year some of my friends and I moved off campus. My router faithfully served us through countless hours of Xbox, video streaming, downloading, World of Warcraft, and many other things. Pro tip: Setting your DNS servers to Google’s servers (8.8.8.8 and 8.8.4.4) is way better than relying on Comcast’s. I graduated, Krista and I got married, and we moved into a small apartment. Here, my router acted as a repeater for the modem/router combo that came with our AT&T package, which had awful reception. Even though it no longer had to deal with dozens of clients at a time, or gigabits of data within an hour, it continued to work without issue. Although the official logs are now lost forever, my router easily processed and correctly delegated dozens of terabytes of data across all sorts of network configurations and between hundreds of clients. At times I treated it pretty poorly, but it stood up to the overclocking, overpowered abuse and easily outperformed a stock router any day of the week. It was the best $60 I have ever spent, and I never expect to own another router like it. Rest well, my WRT54GL. You did a good job. Posted under Notebook with tags college, life.